In 2028, Earth is suffering from a global energy crisis. 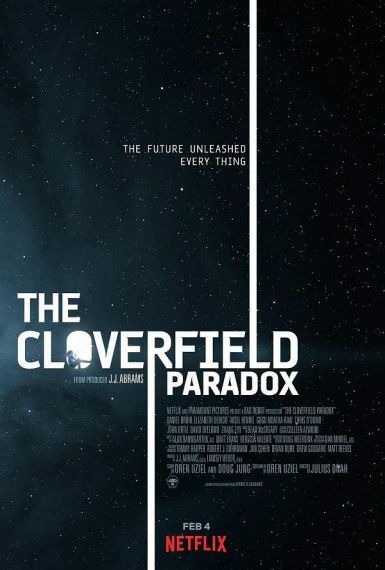 The space agencies of the world prepare to test the Shepard particle accelerator aboard the orbiting Cloverfield Station, which would provide Earth with infinite energy, while conspiracy theorists fear it will create the "Cloverfield Paradox", opening portals to allow horrors from parallel universes to threaten Earth. Among the crew is Ava Hamilton, an English engineer who frets about leaving her husband Michael potentially for years, as their relationship struggles since the loss of their children to a house fire. The crew is rounded out by American commander Kiel, German physicist Ernst Schmidt, Brazilian medical doctor Monk Acosta, Irish engineer Mundy, Russian engineer Volkov, and Chinese engineer Tam. Read more on Wikipedia.